Pretty straightforward questions, or so you would think, but getting them answered can be far from straightforward. The first challenge is to define what we mean by the term ‘stakeholder’. There are several definitions and the one I prefer is ‘anyone who is to receive benefit from, or intends to dedicate resources to, the service area or project’. This is a surprisingly large group of people, one that will evolve as time marches on and one that will require a few people to identify in the first instance as it requires several world views to capture then all. I usually ask people in a service area or project, to drop the names of people they believe are stakeholders onto post-it notes and then share them with their colleagues. In this exercise I always find some people have identified stakeholders others have forgotten, or simply are unaware of, so the more people involved in this exercise the greater the chance you have of identifying the whole stakeholder population. Not all stakeholders are equal, some are for more important than others and this needs to be reflected in the way you seek to engage, influence and satisfy them. In the first instance put the service area or project onto the wall or table and using the post-it notes created above cluster those stakeholder names that you believe are key to the success of the area or project closer to the centre and those that you believe are less so further away. This simple filtering exercise will reveal your primary stakeholder group and by definition your secondary stakeholder group. The watch out here is to consider their importance in relation to the success of the area or project, and not their importance in the hierarchy. In other words people who hold senior leadership roles in your organisation may well be important people, but in the context of the service area or project you are considering, they may not be important stakeholders as by using the definition above they are not expecting to receive much benefit or dedicate much resource to this area or project. Classifying stakeholders requires some thought, as the classification is a function of the purpose of the area or project you are leading. I usually default to a ‘Power’ and ‘Perception’ matrix as a simple starting point for classification. The vertical axis is ‘Power’ by which I mean how influential are they in affecting the success of the area or project. 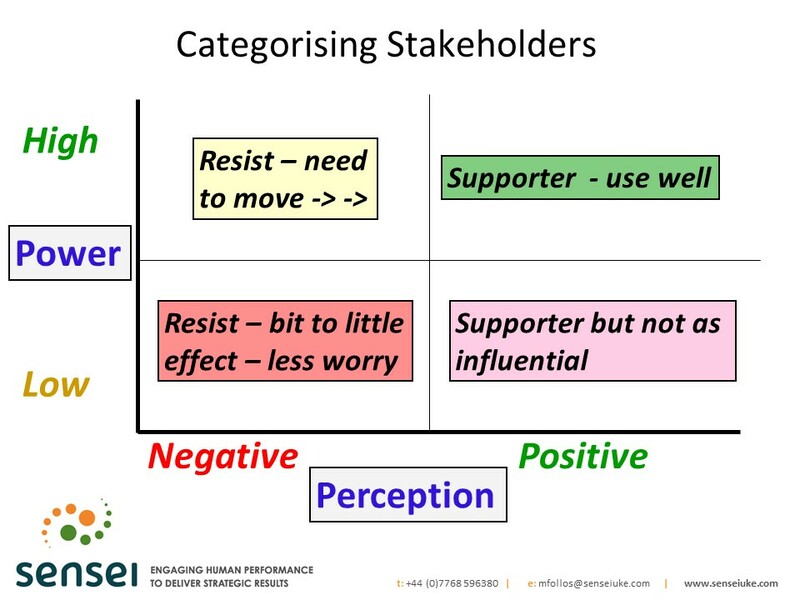 In some cases the stakeholder may have a relatively junior role in the organisation but in relation to the service area or project they can be critical to it’s success, therefore are very powerful in this classification! The horizontal axis is’ Perception’, which is to say how do they feel and what do they think about the service area or project you are leading. To find this out requires a conversation, one you prepare for with great open questions, high listening skills, low defensive attitudes and careful expectation management. Those people with positive perception will be supporters, those in the middle will be neutral and those with a negative perception will resist and may detract from your success so need to be influenced and communicated with accordingly. needs. For each audience work out how best to grab their attention, which media do they prefer to receive messages from and how will your communication stand out in what is a very noisy world. Here you are only limited by your imagination but please recognise that a blanket email transmission of the latest status report will not hit the mark, it will be ignored. One of the more effective projects I worked on in this area was a communication project called project ‘Shush.’ The aim was to disseminate key messages around the organisation quickly and the team recognised the already vibrant internal grapevine did this pretty well so they simply used this. 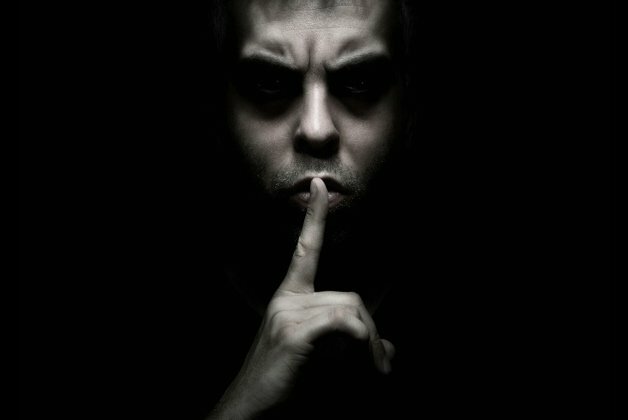 They ‘leaked’ messages out in a controlled way and listened for the echo as the ‘need to know’ messages spread like wildfire around the organisation. Another Service Area I worked with hired the billboard on the local roundabout outside the organisations carpark and posted updates and key messages on this so it was visible to all as they drove, cycled and walked into work. Innovative communication that makes people smile and captures their interest will always hit the mark. For the key stakeholders that have a negative perception then an influencing strategy is required. Remember you will only influence successfully on their terms not your own, so it is important to ‘seek first to understand’ their perspective and then ‘match and pace’ their concerns to progressively neutralise their negative perceptions. You might need help with this and those stakeholders in your ‘supporter’ group as classified in Tip#3 above may be better placed to help you move your ‘resistors’ into a more productive place so do not be afraid to ask for help in this area. Asking stakeholders what they want too early in the thinking and planning process can be futile as they probably do not know. They might be able to describe the symptoms of the problem you are trying to solve, or the ideal outcome they would like if they had no constraints, but at the start of a new project or new service there is a lot we do not know we do not know. So tread carefully with the initial conversations. Explore what expectations they have for success, what constraints and risks they can foresee and ask them what Tangible, Intangible and Peripheral benefits they envisage as a result of the work you are doing. For more tips in this area take a look at my previous blogs on the topics of: ‘The art of persuasion’; & ‘The Search for Value’. Managing stakeholders is key to managing your areas/project success and your own reputation and is something that requires careful consideration and skill to achieve. If this is something that you would like to find out more about then please contact me and we can explore this further. ← Leadership tips for taking over an existing team.